Cazenovia, NY (March 10, 2016) – Friday night movies are coming back to the Catherine Cummings Theatre, and it wouldn’t be complete without the piano playing gorilla! 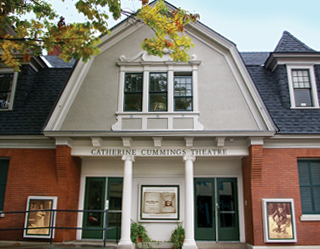 This program is possible through a partnership between the Catherine Cummings Theatre at Cazenovia College and the Cazenovia Area Community Development Association (CACDA). Many community members recall enjoying movies at this vintage community landmark and the organizers are pleased to bring back the opportunity to enjoy both new releases, as well as the classics right here in the village. The movies will be shown on Friday evenings at 7:30 pm. The first movie Star Wars: The Force Awakens is scheduled for March 18. The rest of the schedule includes, Inside Out (April 22), E.T. (May 20), Zoolander 2 (June 17), and Creed (July 15). The cost for the movies is $6.00 general admission. Tickets will be available at the door. Fully updated digital technology and full sized screen make the theatre a wonderful venue for movies. Community members will enjoy the nostalgia of the local movie theater experience, as well as the thrill of big blockbuster films. Refreshments will be available for sale. "I have talked with so many people in the community who saw ET, Jaws, or Indiana Jones years ago when the theatre was a movie house run by the Googin family, and I am thrilled to partner with CACDA to bring them back as part of this great community! I am confident that the movies will be well received so that we can expand the number of days we present per month, and add additional movie programming," said Theatre Director, Colleen Prossner. The theatre is located at 16 Lincklaen Street. For more information, please visit www.cazenovia.edu/theatre or on Facebook at Catherine Cummings Theatre or call 315-655-STAR. Cazenovia College and CACDA are grateful for the support of the series sponsors including the Cazenovia Lions Club; Nicki Donlin, Licensed Real Estate Salesperson, Realty USA; Karen Reynolds, Licensed Real Estate Salesperson, Realty USA; and GoCaz.com/CACDA. Please contact CACDA Executive Director Lauren Lines at lines@cacda.net if you are interested in sponsoring a future movie.